hola, guapa. : fresas y nutella en el parque! fresas y nutella en el parque! 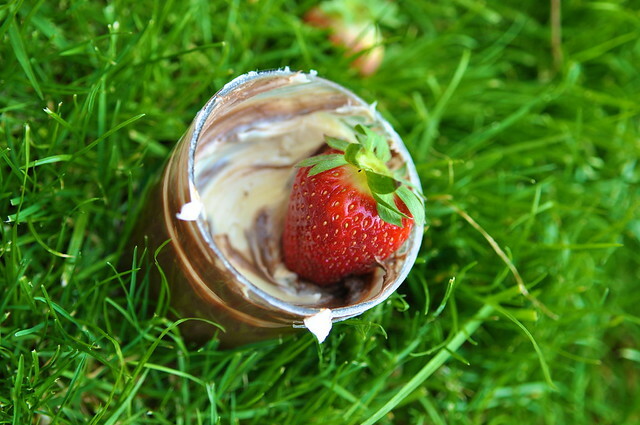 my roommate and i have been talking about eating fresas (strawberries) and this awesome spanish nutella (hazelnut AND vanilla creme) in the park by our house for the past few days. we may even have been a little bit obnoxious about this request. we made this mini-dessert-picnic situation happen. we then searched alcalá for a reasonably-priced dinner, potentially seriously offending a waitress in the process. and of course, we then proceeded to a local pub to watch another real madrid/barcelona match up. they tied, but there still might have been a lot of yelling and drinking and swearing (from the locals, of course)... it was definitely an experience. life is good in alcalá. life is good. Good news. That nutella exists in the states too! When I was in Jordan, I fell in love with eating that stuff with almonds as a little afternoon snack. And I was truly scared to come back to the states because I didn't know if I'd be able to live without it. And I found it at Walmart! It might exist at other stores too, I just didn't look further.